This box is made from seasoning wood free from all kind of moisture and this spice box is widely used for keeping spices of all kind. Fine Decorative Blue Pottery Masala Boxes Available In Different Designs & sizes. Supported by well-informed experts, we are offering an extensive range of Spice Box With Seven Spices. These are made as per market demand. With sincerity and hard work of professionals, we have carved a niche for ourselves in this domain by trading premium quality gamut of Spice Gift Box. We offer an exquisite collection of Stainless Steel Spices Box or Masala Dabba which is used for storing spices in a safe and hygienic manner. 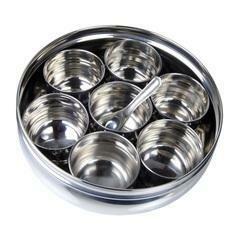 It comes in 7 small bowls and 4bigs bowls according to the requirements of the clients. 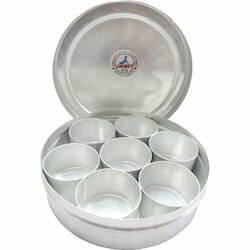 We manufacture our masala dabba using steel and ensure its quality before offering them.